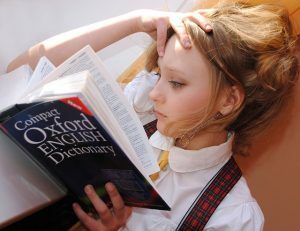 Sooner or later, every student studying English as a second language has to learn idiomatic expressions or idioms. They are those phrases that native speakers commonly use that don’t match the words. Perhaps you heard the expression “it’s raining cats and dogs,” which is a beautiful example of an English idiom. Of course, it doesn’t mean that cats and dogs are literally falling out of the sky; when someone says it, they mean that the there’s a heavy rain. As you can see, learning them could be fun plus they can greatly enhance your understanding of conversational language that English speakers use every day. To assist you with that, I’ve compiled a list of common idioms used in both US and UK English made some examples to make it a little more memorable. When someone says that they “are all ears,” they mean that they’re eagerly waiting for someone to say something. In other words, it means that they are listening attentively and focused on the person who is about to say the things they expect. If someone says that they have “a short fuse,” they mean that they have a quick temper, so it’s easy to get a strong reaction from them by teasing them. In the recent years, one more version of this idiom emerged: “a quick fuse,” but it means a young, passionate leader. This is one is very popular and you’ve probably heard in many English and American movies and TV series if you’re using them to learn the language, too. It means to decide what to do. Someone is beating around the bush if they’re not saying the things they mean. Example: Please stop beating around the bush and tell me exactly what Starbucks you want us to visit today! This one is also pretty popular in English, especially in the business world where people with this ability are highly valued. Students who have the ability to create outside-the-box solutions – especially when giving their friends assignment help – are also very creative individuals. The idiom means to think creatively. Example: Our firm needs a marketing director with at least 5 years of experience who can think outside the box and produce slogans that connect with our target audience. As you probably guessed correctly, no one’s mad at the books here. Despite “hit” means to physically punch, this idiom means “to study.” Students like to use this idiom when they have a lot of studying to do to tell their friends that they’re finally going to begin preparing. In many cases, the idiom is used in critical situations before final assignments when students often call a professional essay writing service to get some help because of the lack of time. This idiom means not liking – or even hating – a person or doing something. Example: I can’t stand John because of his negative attitude towards everything. If you’re a student, chances are you already went on or will soon go on a blind date with someone. A “blind” date means that the two persons who are about to meet and possibly start a romantic relationship have never met each other. If someone calls you a macho, it doesn’t necessarily mean that you’re a gentleman or someone who likes to flirt with women. It rather means being super or extremely masculine (in regards to behavior or appearance), so you often refuse to do things that you perceive as being feminine, even when they’re not. This one means to be very nervous and having a nervous feeling in the stomach. This idiomatic expression means to not judge someone severely because that person had some issues or problems that prevented them from doing something they were supposed to. Audrey is a visual content and digital marketing specialist who finds her passion in expressing own thoughts as a blogger and currently works at A-writer.com. She is a tech-savy person and likes to write on different topics. This entry was posted in Tips and tagged English as a second language, English idioms, ESL. I have tutored youth and youth adult for more than 10 years. I specialize in up-to-college level English, German and Chinese languages and also in developing more interactive approaches to teaching, delivery and assessment. I am committed to promoting lifelong learning and wider access to educational opportunity. Also I have experience tutoing online. I know you are busy so I will get to the point. I’ve been reading through your blog and noticed there are some interesring publications you’ve written about tutoring. · How much does the perfect tutor cost? · Need it a certificate for tutoring? · Should parents coordinate tutor’s study programme?